So what can I tell you about this quilt? Maybe I should just tell you how much I love it and leave it at that? I think you already know how much I love these fabrics. I’ve been collecting them for quite a long time now, with help from many online friends (thanks everyone!). I’m currently working on a quilt with many of the prints, but it’s slow going. So in the meantime, I wanted to do something that would be a little faster and would use some of the prints I hadn’t yet used. 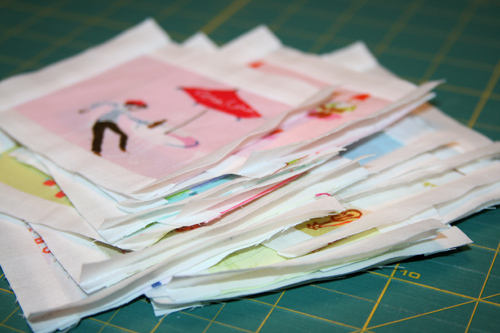 Since these fabrics weren’t designed as part of a fabric line, they don’t necessarily all work together, and sometimes it makes it hard for me to think how to use them in a quilt. (I feel like the quilt should make sense, you know? But maybe that’s silly…). At the same time, I feel the urge to keep them all together, even though you might look at it and wonder why there are kittens paired with tennis players with a few pears thrown in. As I was contemplating this the other night, I pulled them all out again just to look at them and I realized that I really love the background colors, especially when they’re all together. The colors are so bright and fun — hot pink, lime green, orange, purple & turquoise. I decided to go with those colors to create a really bright and colorful quilt based around these fabrics. Each munki munki center has a really thin white solid around it and then on half of them I used a solid as the second layer, followed by a print, and the reverse on the other half. For the back, I used an Amy Butler solid and I pieced in a few extra munki munki blocks. I wasn’t sure about this yellow polka dot for the binding, since I had a feeling that the polka dots were too spread apart, and possibly wouldn’t even show on the binding, but in the end I went with it anyway because I really wanted to use yellow for the binding (and it turns out my stash is a little lacking in yellow!). The polka dots do show in some places and not in others, which actually kind of works with my quilt design – half solids, half prints… ah ha! 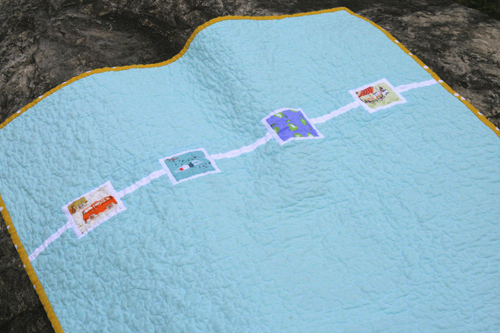 This little quilt measures about 27″ x 34″, and is now listed in the shop! 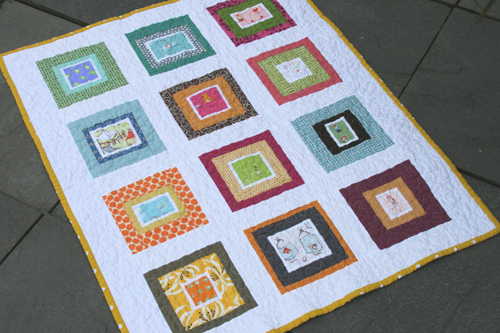 This entry was posted in [search] Square-in-Square Quilts, 2009 Finished Quilts, Finished Quilts, Posts about Quilts, Quilts and tagged baby quilt, free motion, Heather Ross, modern, munki munki, quilt, quilting. Bookmark the permalink. so cute!! 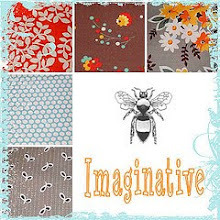 I love those litte fabrics too – and since I never use fabric lines in whole (or mostly, even in part) I heartily approve of your mixing them up! Love it so much! Love the detail of the white around the squares. When I saw the back I was like, OMG, perfect. Don’t doubt yourself………if you love it, you’ve done it right ! And far be it from me to talk you out of keeping it…….but when you have a problem with dark threads being caught in the batting layer, and showing through the quilt top or back, you can take a hand-sewing needles, and using the eye, burrow in to the fabric where the thread is showing. Then you can maneuver it around just a bit and ‘pull’ the thread through and out. It takes a bit of doing, but sometimes it saves a quilt from being ruined by those dark threads ! I’m not a devout HR fan, but you do so some fun stuff with her fabric. And do you work or spend time with Morgan? You can really shurn out the quilts! PS I REALLY love the the back on this one. This turned out BEAUTIFULLY! I love everything about it, the colors, the back, the blocks…well done! so cute! the back (too often?) is my favorite part. and the yellow binding is just the perfect shade, even if its spots are missing in spots! fantastico! is really a lovely quilt!!! i love the back, is just perfect!!! The cuteness here is EXTREME!! Love it! super cute!! i love the bright and cheery colors!! Very very cute! 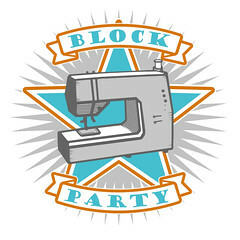 I’m thinking of starting a MM quilt soon and love your other blocks with the pastels. I need to get some solids! Beautiful as usual! I am working on my first Munki quilt right now. I was also wondering if all the prints would work together, since there is no “theme” other than Munki, but I’m going for it! You pulled these all together wonderfully! Awesome! and so fast, it just staggers me. The back is so beautiful and delicate, I just love it. I am just now working on a wall hanging for my mom, inspired by the giveaway you offered a couple weeks ago–and this is now inspiring me to use some of the HR fabrics I’ve been collecting, too. Thanks, as always, for the motivation. Gorgeous! 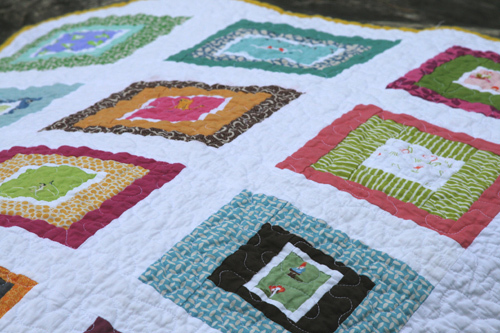 I always love your quilts – they’re just awesome (and so are you)! I just adore this quilt. I love that you put all the different prints into one quilt!! I wouldn’t blame you for keeping it, I need to make a HR quilt of my own. I never feel like I have enough to start though…..the words of a true addict!! I just love your work. I’ve been lurking around your blog for quite some time. I was wondering…. what white fabric do you usually use for your lattices and such? I have a bit of trouble with Kona stretching, but I do love the feel of it. Thanks. oh, i hate those stray threads! they are inevitable, aren’t they? i love the front. but i LOVE the back. it’s cute all around. even down to the half dotted binding. nice work! Ooh, I wouldn’t want to part with it, either! Really great! And I love the design you made on the back. Very cool. Great quilt. Love your site as there’s always inspiration for color and design. I have even dared make quilts based on photos, instead of using patterns alone. what you did on the back there is very cool. Great design, gorgeous colors, and a wonderful way to show off some incredible fabrics! 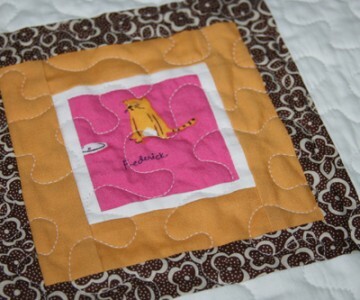 What I really like about this quilt is how you have framed some of the Munki prints with a white border, it frames them nicely and draws the eye. For me…it’s a keeper 😉 Nice work Ashley. I think it’s a perfect reason to keep it! i stumbled onto a pair of munki alien pjs today…yippee…my collection is growing. 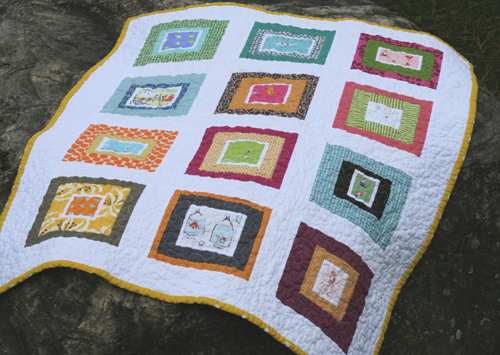 i love how you used them in this quilt. they’re soooo cute. Pretty gorgeous Ashley. This is a great way to bring all those wonderful but different HR fabrics together. I think you’ve done splendidly! Well done again. i love it too! i’ve been thinking of my future munki quilt and thinking the same thing about the lack of going- together-ness of all the prints. i love you yours turned out and i LOVE LOVE LOVE the back. maybe i’ll just do that. Love it! I have been wanting to try these blocks, so I’m glad to read about your method to each border around the center square. That back is awesome! I am amazed at the quilts you make! It’s lovely! Wonderful!!! I think I may try something similar!!! This is really lovely and the fabrics are gorgeous. I’ve never seen these fabrics on the web. I wonder if they are available. Have to go and look. I love all your drunk love quilts! love it Ashley! And definitely, you should keep it. Even if there weren’t minute (imaginary?) spots on the back! 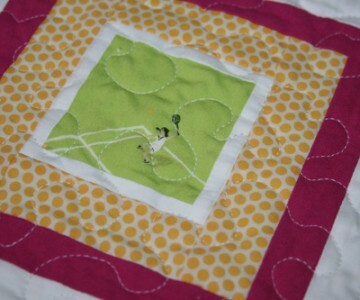 I love the way you add blocks to the back of the quilt too. I’ve been afraid to try it b/c I’m sure it’ll end up being squint. Any tips? Love your quilt and the back is adorable. Great Job! !